Bank Account Validation allows merchants to mitigate check acceptance risk at the point of sale by providing an opportunity to validate that an account is open and in good standing prior to the account being loaded into a recurring billing engine. This means that data entry errors, potentially closed accounts, or fraud can be caught before finalizing the sale. Bank Account Validation options range from negative database options to automated routing number check, to near real-time inquiries into current checking account status. These checking account balance inquiries require the customer to either log-in or provide credentials to their online banking system. Electronic Bank Verification tools significantly reduce payment acceptance risk by validating in real-time the customer has an active bank account with positive funds status. Within the credit card realm a business is able to authorize that the customer has the requisite funds on their card at the time of payment, thereby reserving those funds for capture and settlement. This means that the business knows for a fact that they are getting paid at the point of sale. The ACH or electronic check world unfortunately lacks the authorization component present with credit cards, meaning that Bank Account Validation is needed to mitigate payment acceptance risk. Without Bank Account Validation your newly onboarded customer may require significant work to obtain correct or valid checking account information. 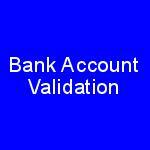 The Bank Account Validation process begins with an ACH transaction being processed. The transaction is processed today, and is sent to the ACH network for debiting the customer the following morning [assuming tomorrow is a banking day].Two banks are involved in the process: The bank that initiates the debit on behalf of their merchant [ODFI], and the customer’s bank [RDFI]. The banks have another day to take care of any payment rejections reasons (eg NSF, closed account etc.). Payment rejects are only discovered after payment is accepted; in some cases days later. Consider a business that pays commissions for new customers. Their sales team brings on a new client and is paid. Unfortunately, your bank reports back days later the check payment rejected. The business has multiple issues to address; The commission payment may need to be pulled back, that customer must be contacted for payment, and accounting may need to be undone. A Bank Account Validation system is a necessity to mitigate such risks.